When you are undergoing a significant Pluto transit, Pluto will help you…and, I mean big-time help, too! Over and over it happens immediately after you let go of your old baggage. A very common occurrence is that the right person comes into our life at such a time. Other examples: people undergoing lawsuits that have been filed against them are suddenly dropped; ongoing tensions within a family are suddenly resolved. The stories are too just numerous to share. When you remove your blockages, the Divine flows to you in all its fullness. That’s how the planets work. Many people are so afraid of Pluto and Saturn mainly because they don’t understand their essences. Isn’t that usually the case? All of the planets are planets of opportunity if we go with the flow of what they intend. After all, they are energies within us, and symbolize our basic instinctive archetypal nature. This can be hard to understand. Are you afraid when you’re health turns bad? Sure, it’s not pleasant. But, after treatment, we’re usually much better off. That’s Pluto, if we had been more proactive, we possibly could have avoided much pain and suffering. If we have attempted to shove our issues under the rug, Pluto eventually lifts up the rug, exposes all the “dirt,” and burns it to ashes. This mirrors the process that we are observing all around us today in the USA and globally. The main problem we are having with Pluto is that many of us are falling into the trap of projecting our problems onto someone or something else. This myopic view is misguided and dangerous. This isn’t a condition that is “coming soon,” we’re in it! Pluto is affecting all of us heavily from 2008-2023 because it is in the sign of Capricorn – the sign of institutions, governments and forms in general. Pluto is finished prompting us. Pluto doesn’t warn; that’s for the other planets, like Saturn. Pluto says, “Since you didn’t heed and adjust accordingly, I’ll get this settled once and for all.” If you think the USA is going back to any semblance of what it used to be, well… it’s all new territory from here on out. We can make it great! Pluto “rewards” those that look deep, face the music and say to themselves, “I’m ready to let go of all of that old junk” and get on with things. This cannot be expressed enough – the coldest, most distant planet in the solar system that we call Pluto will help us. It will help to clear the way for you to revive your life. It will bring powerful people to assist you; money out of nowhere; books that say just the right thing; job opportunities; impossible bosses will suddenly disappear, etc. You just have to say yes, I’m ready and be willing to let go of the old stuff. This is how the real astrology works. It’s not to be found in Cosmos’ Bedside Astrologer. On the other hand, if we hold onto the old, well, the outcome is such a drag that pain will take one of its multifarious forms. When we don’t go with the planets, we are not receiving the signals from our own inner sensors and are actually living against our best and highest wishes. It has to be this way. Among Pluto’s other pleasant roles, it is the refuse-man of the zodiac. Some force has to have the final say. You may not know this, but this Plutonian archetypal energy is the very same sense you get inside when you become fed up and feel that you have no other option other than to scrap an entire project and start over from scratch. It is ultimately a very healthy process – one that is life supporting. This is why so many people totally renovate their homes; down to the rafters, during Pluto transits. It’s that simple. We’re always creating our own reality, even if it seems harsh. In most Plutonian situations that go badly, it really seems as if a slow, gradual, long-term “death wish” is being granted. 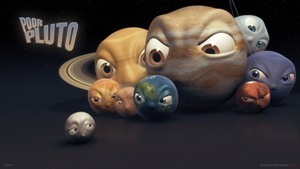 Pluto and all of the “planets,” are really at your behest. Pluto rules our passions, which is why Scorpios (ruled by Pluto) are so full of passion. When we suppress our strong desires, they just become stronger and more insistent. Festering emotional conflict usually ends up being expressed in a very unpleasant, distorted fashion. Pluto wants us to live out our passions – to become them. That’s why we have been able to respect and enjoy Pablo Picasso, Joni Mitchell, Georgia O’Keefe, Neil Young, and Dylan Thomas. If you don’t let go, it’s not the planet that eventually comes to bring your comeuppance – it’s your own creation. Astrology simply tells us when and maybe how. In such cases, we’ve known all along that someday “it would catch up with us.” Sounds like a rotating planet to me. What goes around, comes around. For many of us, we know when that point comes in our life where we just cannot keep following the same antiquated “lifestyle.” Many of us are experiencing this now because Pluto’s current position in early Capricorn is having its effects greatly exaggerated. Since early 2008, it has been time to clean house individually and collectively. It’s not the economy, silly. Pluto looks straight through you. Why? Believe it or not, Pluto is obsessed with the truth. And it can see falsehoods coming from 1,000,000 light years away. So now, under this massive Pluto transit in which we find ourselves, if your relationship is dead and you keep kidding yourself, you have to let it go or it will corrode quickly and may in fact become dangerous. If you are no longer relating, there is no relationship. If this brings you a painful realization, it is because the light of awareness is shining up through you revealing the “stuckness” in which you have chosen to remain. The shoes no longer fit. The great news is about all the good stuff that happens when you finally free yourself from the old stagnancy. Your feet don’t ache anymore. I have no intention of advising people to stay together or break up. That is up to you. Astrology is about enhancing your freedom and utilizing all of your energies for the best and highest good. Truthfully, in many cases, it’s not so much that relationships need fixing, it’s more likely that the individuals involved need to take an honest appraisal of their own stuff. The best way to keep Pluto happy is to “get real.” Are you really contributing and relating to your mate? You get real and Pluto will really show off. Man, that question will wake you up.